UK band Eagulls will be in NYC next week for CMJ and we already knew they were playing the free Kanine/SESAC day party at Pianos on October 16 and an evening showcase at Mercury Lounge on October 18 (sold out, but some badges will be accepted). The band have added a few more shows while here: they’ll play the NME showcase on October 16 at Glasslands with Yuck, Porcelain Raft, Courtney Barnett, and Theo Verney (tickets); and the Bowery Presents day party on October 19 at Pianos (line-up TBA). They’re also playing one of BrooklynVegan’s CMJ-week shows too, more on that very soon. 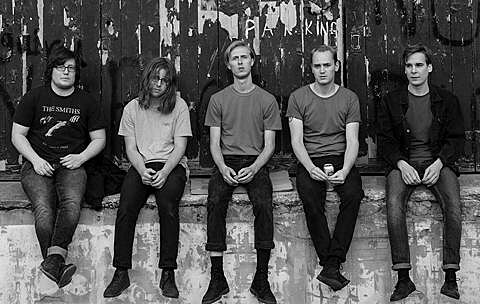 All Eagulls CMJ dates — with set times and full show line-ups where available — are listed below. Meanwhile, Eagulls have released the b-side to their new UK 7″ which is a cover of Killing Joke’s “Requiem.” You can check out the video for the killer a-side, “Nerve Endings,” below as well. Wednesday 10/16 – Kanine/SESAC Party @ Pianos – (5:45pm) w/ Eternal Summers, Bleeding Rainbow, Beach Day, Joanna Gruesome, Valleys, The Hostory of Apple Pie.